The 2016 Chevrolet Camaro is the first in a more than a decade to be built in the United States, with GM ending production of the 5th gen Camaro in Canada shortly after launching production of the 6th gen Camaro at the Lansing Grand River Assembly Plant. The Camaro is now built alongside the Cadillac ATS, the CTS and the V- Series performance versions of both Cadillacs so as you can imagine, the facility has gotten very busy over the past few months. 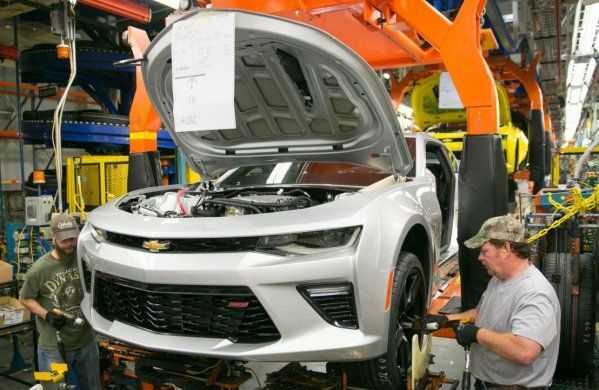 In fact, GM expects to sell so many Cadillacs and Camaros built in Lansing that they will soon add a third production shift to build these popular models – a move that will add more than 500 hourly and salaried jobs in Michigan. Whenever a new model of a famous car like the Chevrolet Camaro is introduced, the company will see a big spike in sales as buyers rush to grab the hot new muscle car. This happened with the Ford Mustang and the Dodge Challenger in late 2014/early 2015, and with the delivery process of the 2016 Camaro beginning in November – the time has come for the Camaro team to enjoy the big spike in sales. While we are still waiting for the end of year sales numbers from Chevrolet, reviews on the 2016 Camaro from both media outlets and proud new owners have been fantastic, so we can expect that Chevrolet is going to sell a ton of them over the next few months. GM believes that the 6th gen Camaro will lead to a big boom, especially when the weather warms up this spring. This Camaro is lighter, more powerful and more efficient than the previous models, which should lead to even stronger sales numbers than what the company saw with the segment-leading 5th gen Camaro. To prepare for that rush and to continue building the Cadillac ATS and CTS at an acceptable rate, GM will launch a third production shift at Lansing Grand River in the second quarter of 2016. The hiring process for the Lansing Grand River third shift is already underway and when completed, more than 500 new jobs will be added at the facility – leading to a total workforce of roughly 2,300 men and women. 2016 will likely be a great year for General Motors and Chevrolet, as the 2016 Camaro could lead to record sales as gasoline prices are expected to remain low.